"One of the simplest and most valuable devices to help with a difficult intubation is the bougie. The primary use is a difficult intubation, when you cannot see the larynx well but are able to predict where the glottic opening should be based on anatomy. However bougies must be used with care to avoid patient injury. The bougie is an endotracheal introducer that is made of a braided polyester base with a resin coating, giving it both flexibility and stiffness at body temperature. 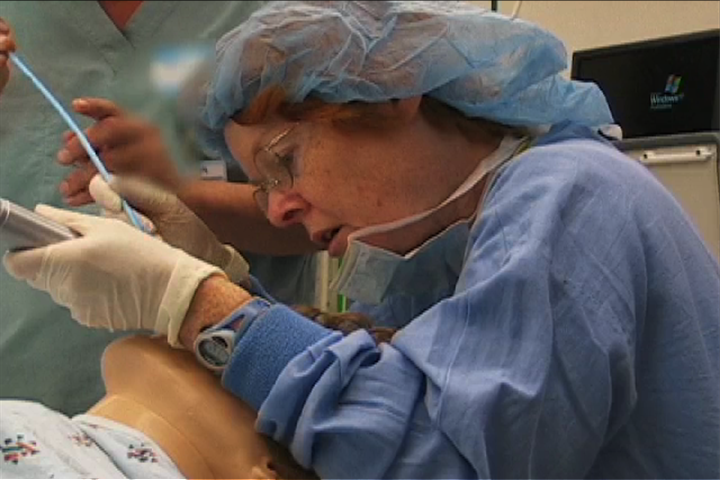 The standard size for intubation is 15 Fr, which is 60 cm long. There is a 10 Fr pediatric version which can be used for endotracheal tubes as small as 4 to 6mm. A bougie will retain the curvature given to it, making it very useful for anterior airways. I highly recommend that you have a bougie in the room whenever you intubate because it is a quick and easy aide when the unexpected difficult intubation occurs. However, like so many of our tools you you have to use it wisely or you can seriously hurt your patient..."